The budget document shows trunk road spending up* a massive 18% to £820m, with rail down by 7%. In a welcome attempt to clarify active travel funding more clearly than in previous years, the budget document states that the total going to active travel from the main sources will be approximately £39m. We add a guesstimated £2m for cycling investment in association with trunk roads, giving a £41m total, i.e. just 1.9% of the £2215m total transport budget. 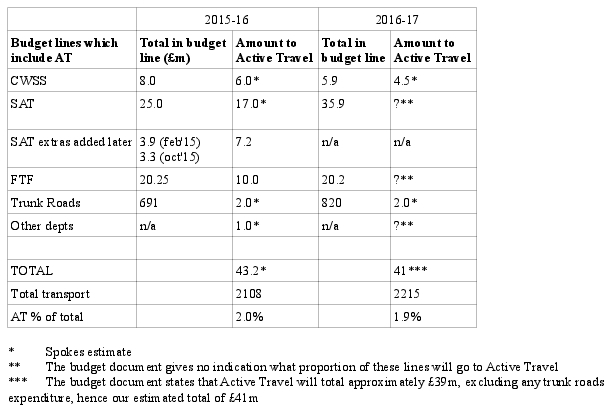 How the active travel total of ‘approximately £39m’ is arrived at remains obscure in the budget – as in previous years. The Sustainable and Active Travel (SAT) line rises from last year’s £25m (+£7.2m added later in the year) to £35.9m, whilst the Future Transport Fund (FTF) remains at £20.2m. However the portion of these two lines which goes to active travel varies drastically from year to year, and is not stated in the budget. SAT/FTF are likely also to provide cash for electric vehicles, bus innovation, etc. We again fail to see the logic of a split into SAT/FTF lines rather than into ActiveTravel/OtherSustainable. Included in the government’s £39m estimate is the CWSS Fund (Cycling, Walking, Safer Streets) – the most basic active travel fund, on which all Scottish Councils rely for base active travel funding, and use to raise match-funds from elsewhere. But this is slashed by 25% from £8.0m to just £5.9m. The SNP government has never liked CWSS, first introduced many years ago by Sarah Boyack MSP when Transport Minister, and have previously tried unsuccessfully to scrap it completely – prevented only by a massive campaign resulting in a budget ultimatum from Patrick Harvie MSP at a time when the SNP did not have a majority. Overall, active travel spending will be if anything marginally less than last year, and way under European levels, once again casting serious doubt on the government’s wish and ability to achieve 10% of all trips being by bike in 2020 – just 4 years away now. Perhaps one element of comfort is that active travel funding in Scotland has at least done better than England received in the recent UK Conservative spending review! Spokes has urged the Parliament’s ICI Committee to make a forceful response to the budget, if it wants Active Travel cash raised to a more realistic level. Spokes is supporting the #WalkCycleVote campaign for 10% of transport cash to go to active travel. Please support these efforts by contacting your MSPs. *January footnote: It has become apparent that the reason for the big trunk road increase is that the £745m Aberdeen Western Peripheral Road has been reclassified. It is being built by a form of borrowing which meant that previously it did not appear in the budget. New EU rules, however, mean that it must be shown, so the draft budget now includes this year’s government payments on the road. Note – this is a complex financial issue and this paragraph represents our current understanding. Regardless of the complexities, however, the fact remains that the draft budget 16/17 now provides £820m for motorways and trunk roads.